On this Friday short we catch up with Weightlifting Apparel start up Third Pull Apparel. Coach Joe and Rob Filebark, the company's Co-Founder, are actually old high school friends who got back in touch by accident through the barbell. Third Pull specializes in linking pop culture icons with the Weightlifting world. The shirt that put them on the map was Boba Fett depicted in the bottom position of the clean. Since that design other popular characters like Ron Burgundy, Rocky Balboa, and even a few of our founding fathers have been depicted practicing the classic lifts. Third Pull’s gear is worn by some of America’s top Weightlifter. Not because Rob pays them to play, but because their stuff is just cool! Check out their full line of custom socks, hats, T-shirts, stickers and more at https://www.thirdpullapparel.com/. Rob provides some great tips for anyone looking to start a new business or build their social media audience. The two long lost buddies discuss start up strategy, the importance to knowing your audience, social media strategies, and developing your own creative. This is a fun and informative chat. Look out this Friday (11/25/16) for black friday deals on their website and be sure to follow their instagram feed (@thirdpullapparel) for great deals on their gear and meme’s sure to entertain. 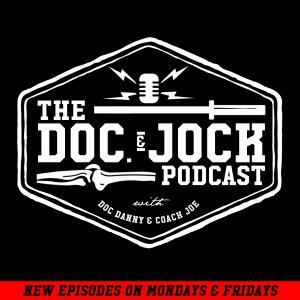 Post Comments about this episode, potential topics, suggestions for interviews and questions to the Doc and Jock Website, facebook page, and twitter account.